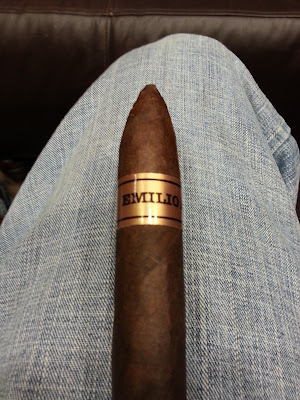 Appearance (0-20): Being the first Emilio cigar that I am smoking, I really didn't know what to expect. This particular stick, the AF2, is sporting a dark brown habano oscuro wrapper. There are no noticeable blemishes, soft sports, or prominent veins that are of any concern. The rolling of the cigar also seems to be very well done. The band is kept quite simple, using only a copper background and some text to signify the Emilio AF2 blend. I’m not going to dock any points for the band, but it could use some artwork to grab some attention. Construction (0-20): Being the first Emilio cigar that I am smoking, I really didn’t know what to expect. This particular stick, the AF2, is sporting a dark brown habano oscuro wrapper. No blemishes to speak of as mentioned earlier, and the rolling of the cigar also seems to be very well done. The band is kept quite simple, using only a copper background and some text to signify the Emilio AF2 blend. I’m not going to dock any points for the band, but it could use some artwork to grab some attention. Strength (0-20): Accompanied with excellent flavor, this stick gives you a decent kick as well. Med-full to Full, you will enjoy a full flavored and full bodied cigar. Flavor (0-20): Right off the bat, you are sprayed in the face with a pepper blast. There is a nice compliment of chocolaty sweetness to accompany it during the first third of the cigar. The pepper flavor subsides a bit for the second third, and balances out with a vanilla bean and caramel, before bringing back some spice for the final third. The blend was enjoyable throughout the whole stick, and has my personal favorite of a very spicy stick with great sweet balance. 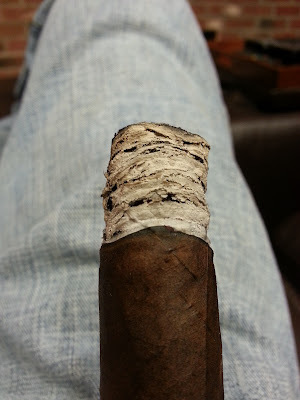 The flavors were full, and mingled very well together as they transitioned through the cigar. Value (0-20): $7.50 for a torpedo!? Sign me up immediately for a 5 pack, and potentially a box. The blend was excellent, and there were no negative factors that were of note. Great pricing! Additional Notes: Smoked at Cigars International, paired with coffee. After some further reading, it turns out that my favorite blender, AJ Fernandez, created this particular cigar. Overall (0-100): Well I smoked this cigar blindly, never hearing about Emilio cigars before. This cigar was excellent to my standards, and I will likely be buy a 5 pack or box to start some aging on them. I look forward to the next bunch of Emilio cigars in the reviewing pipeline. I also want to thanks Gary Griffith, of Emilio cigars, for giving my brother and I the opportunity to smoke and review some sticks!